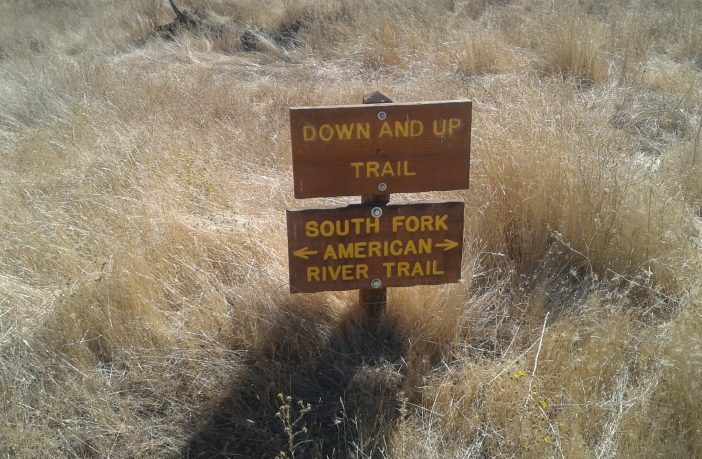 The South Fork American River Trail, abbreviated SFART, is a relatively new trail (dedicated in October, 2010) in the Sierra Foothills several miles below Auburn. The trail was a project of the American River Conservancy and is now operated and maintained by the US Bureau of Land Management, BLM. 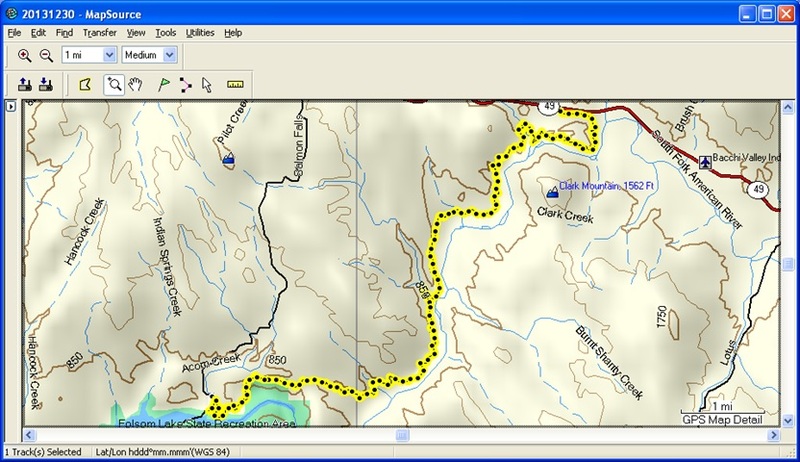 I ran the trail with a Joe Condon, so we were able to do it as a point-to-point hike. We dropped a vehicle off at the Salmon Falls bridge and then hitched a ride to Coloma to the trailhead. We started at about 10:30 AM and finished about 2:00 PM. It was a fairly warm day so we both had hydration packs. The trail begins at the Magnolia Ranch Staging Area trailhead, which is on CA-49 about 3 miles past Pilot Hill, a crossroads town about 10 miles east of Auburn. 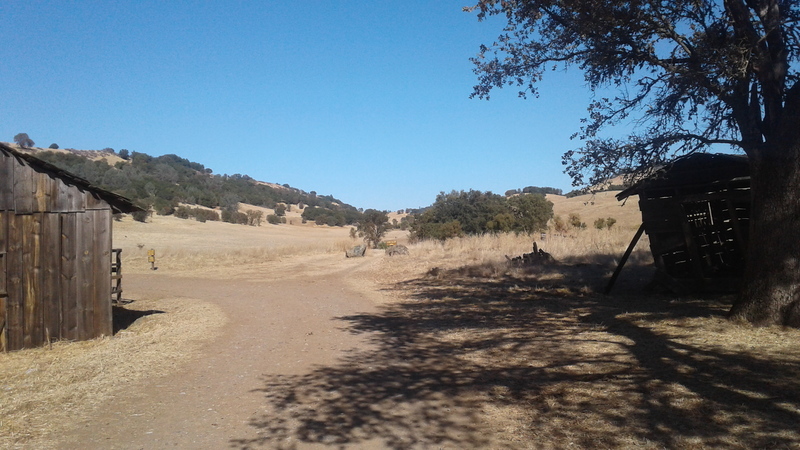 The lower end of the trail is at the Skunk Hollow Staging Area on Salmon Falls Rd between Pilot Hill and El Dorado Hills, at the upper end of one arm of Folsom Lake. Skunk Hollow is about 270 feet lower than Magnolia Ranch. Quick history note: Another few miles past Pilot Hill is the small town of Coloma, where James Marshall discovered gold in 1848 and set off the California gold rush. The trail is relatively level for the first couple of miles, heading east, then south, then west, curving around a hill. The sky was brilliantly clear. Just over 1 mile from the trailhead was the first view of the South Fork American River through the trees, perhaps a teaser for the more dramatic views to come. The trail alternates between open and forested areas, including oak and some pine in the forest. Most of the trail is within the Cronan Ranch Regional Trails Park. The signage is excellent, a feature that is especially appreciated by first-time visitors but is helpful for repeat visitors as well. 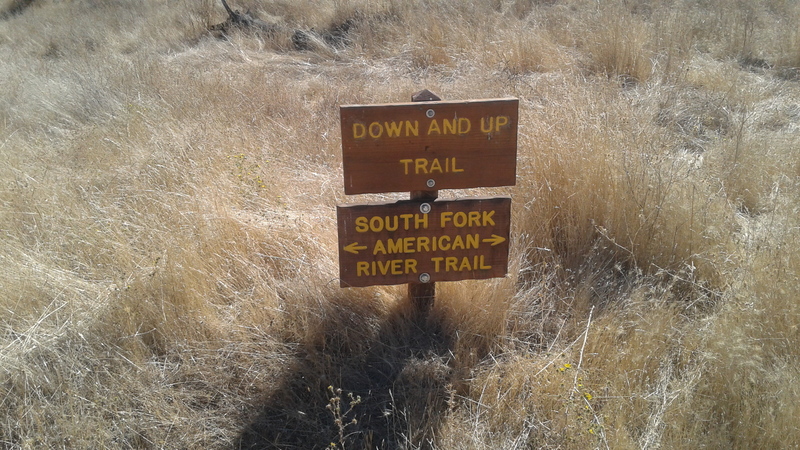 The first part of the South Fork American River Trail is along the Gerle Loop Trail. After dipping down to cross Hastings Creek, the SFART follows the aptly-named Down and Up Trail. For about 5½ miles the trail stays within about a 300-foot elevation range, gaining and losing more like 800 feet along the way. About 4.8 miles from the trailhead there is a surprise: the remains of several buildings that formed part of a movie set! The buildings were built for the movie in 2003 and were evidently not intended to last. The trail begins to curve from southward to westward and rolls up and down 100 feet or so several times. From one of the high points there is another view of the river before the trail turns away. During the section going east, the trail leaves Cronan Ranch Regional Trails Park and passes through the Pine Hill Preserve, which contains rare plants that only grow in the area. The trail climbs one final hill, reaching the 1000 foot elevation level. The last 2 miles are a steady descent, with the exception of a short 100-foot climb. About 1 mile into the descent, and 1 mile from the ending trailhead, there is a great view of Folsom Lake and the Salmon Falls Bridge 300 feet below. We found our vehicle right where we left it! Next stop Auburn Ale House!